Preheat oven to 425o F. Put bread, half the basil leaves, and salt in a food processor and pulse until finely ground. Pour into a large bowl or plate. Coat a 9 x 13 inch baking dish with oil. Lightly beat 1 egg just enough to mix the yolk and white. Dip each chicken breast into the egg mixture and then dredge them in the crumb mixture, covering well. Place coated chicken pieces in baking dish and turn over once to coat each side in the olive oil. Bake approximately 12-13 minutes. Place onion and garlic in food processor and pulse briefly to chop into smaller pieces. Add the rest of the basil, canned tomatoes with juice, and salt and puree. 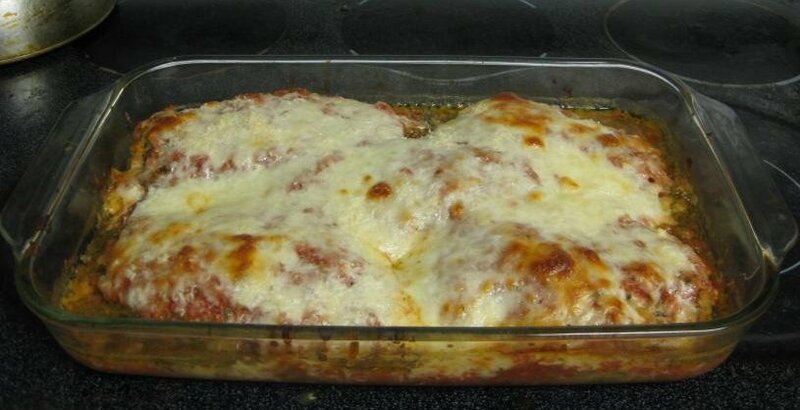 Remove baking pan with chicken from the oven and pour tomato sauce over the chicken completely covering them on all sides. Sprinkle mozzarella evenly on top and then top with the romano cheese (parmesan can be substituted if preferred). Bake until bubbling and top is lightly browned, approximately 15-20 minutes. Makes 4-5 servings.